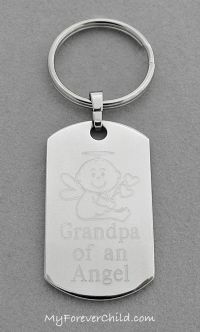 Our personalized dog tag keychain makes a great gift for Dads and Grandpas. Choose from one of our signature images engraved on the front of a large stainless steel dog tag. Made from 316L stainless steel, these high quality tags are sure to please. This keychain uses our signature images and comes with your choice of saying on the front, select in the drop down box below. If you'd like a different saying on the front of the keychain, fill in the option text box.